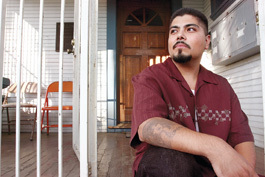 There must be some way out of here: San Jose gang expert David Madrid tries to show how solutions to the violence can't be effective if they don't address the correct problem. The same needs to be pointed out to U.S. policymakers in Iraq. MARCELLUS "Bishop" Allen is introduced on C-SPAN as a former Philadelphia gang member and founder of SOS/"Save OurSelves." Despite halting speech and blighted English, he speaks eloquently about the lack of love in his urban community and the effect this has on increasing crime, lowering employment opportunities and creating a sense of desperation so deep pre-teen black kids are essentially hopeless before hitting middle school. Allen then transitions into why his organization is important, and why there's reason for hope. Giving the rapt audience of black intellectuals, politicians and entertainers a concrete example of that reason for hope, Allen describes how a truce between the Crips and the Bloods was negotiated with the help of "people we could trust." Who were the trusted peacemakers? Perhaps trained negotiators from Philadelphia's Black Policemen's Association or some African-American preachers? No, the most trusted organization these gangs elected to stop an eruption in street killings was the Black Panthers. Seeking peace in the streets through the auspices of America's first black organization to espouse violence as a legitimate political tool makes about as much sense to most Americans as Lebanese civilians seeking the protection of Hezbollah. But distrust of The Man is sometimes all it takes for people to seek alternatives. The polarized debate about Bush's Iraq strategy and anti-terrorism tactics has centered until now on noble things like defeating terrorism, ridding the world of Saddam Hussein and winning hearts and minds. Slightly more than a third of America regards this "fight there instead of here" strategy as correct, and the rest of us consider it either a great goal ineptly implemented or a dangerous delusion that creates more terrorists than it captures or kills. But if you listen directly to what Iraqis and others from the area are saying, you may end up thinking both sides in the three-year-plus debate over Iraq have it wrong. While our talking heads shout at each other about the wisdom of the Bush doctrine and the degree of competence in its execution, Iraqis are dealing with something more immediate: their equivalent of the Bloods and the Crips, of the Norteños and the Sureños—only armed with rocket launchers, political aspirations and respected holy men blessing their death squads. Such a characterization is guaranteed to offend many here. There seems to be a need—ironically most prominently among the same right-wing types who deride political correctness everywhere else—to view Iraqis much as we prefer to view ourselves: yes, we have our differences, but we resolve them with ballots rather than bullets. But those who insist on thinking of Iraqis as neo-Americans would do the political discourse a favor to refine the analogy a bit. Iraqis are like one group of Americans: the Hatfields and the McCoys. Coming from an American or a Brit, that analogy is the kind that can cause riots throughout the Muslim world. But it's essentially the view now being voiced by Fouad Ajami, a noted Arab-American who helped convince the Bush administration that what Iraq needed in 2002 was compulsory democracy, American style. Ajami also helped persuade the administration that American troops would be greeted as liberators. The irony is that Bush chose to believe Ajami's dead-wrong assessments, while leaving the essential bigger picture that Ajami presented on the shelf. This Iraq depicted by Shiite Ajami and other Arab observers bears little resemblance to the simple map presented on American TV news: Sunnis in the middle, Shiites in the South and Kurds occupying the north. There are sects within sects, feuds within those, and alliances more tribal than national between affiliated groups living in the surrounding countries of Iran, Syria and Turkey. It looks more like the way a San Jose police gang task force member might visually describe local areas of Norteño and Sureño gang influence: a checkerboard that changes block to block and sometimes house to house over time, depending on who has been locked up or killed. That's the most important reason why Bush's attempt to position Iraq as the "central front in the war on terror" is so absurd. While there's at least the theoretical (though discounted) possibility bin Laden and Hussein were cooperating, there's no chance that throwing our soldiers at what is essentially widespread and uncontrolled gang warfare is going to help anyone. We can no more rid the world of this kind of killing with armed forces than the Los Angeles or San Jose police departments can eradicate gangs with stun guns or the kind that shoot real bullets. It doesn't work that way. Only when you defeat the mentality does the organization built on it shrivel. That's essentially the same message San Jose youth educator and gang expert David Madrid conveys in his work locally. Madrid says that while the San Jose police prevent things they can control, like Cinco de Mayo violence or sales of blatantly gang-oriented clothing, they're proving nearly impotent against the central lure of gangs: identification with something larger than one's self. While people outside the community mostly see Norteño vs. Sureño conflict as imbecilic infighting, a large portion of young Hispanics see it as a fight over something that matters a great deal. Ironically, their fundamental grievance is something that would resonate with former Gov. Pete Wilson: that they are being "overrun" by Mexican immigrants, a.k.a. "Surenos"—literally, "people from the south." Gang intervention seems to be working, if you measure success in not having to calculate the odds of a drive-by every time you plan a shopping trip to Santana Row. If you don't follow the news, you may never even hear about gang activity. Meanwhile, the emotional allure of gangs increases just as the number of gated communities grows to literally wall the consequences off. Silicon Valley is like the rest of America in this respect: most of us aren't really concerned with gangs unless their bullets reach our neighborhoods. The proof in that is that decades into a "war on gangs" there are more gangs, and more gang members in more parts of America than ever. That reality may not touch most Americans outside of gangsta rap lyrics, but many of the poorest among us live in the ugly crucible of gang mentality on a daily basis. In such an environment, the worst thing we could be giving the Iraqis now is yet more varieties of gun-toting men. To some, our troops are the people that throw candy and MREs to their kids. But to many, our soldiers are perceived as just another gang—the gang that can call in an air strike, but can't get the electricity to work. In a further irony, pushing our "coalition of the willing" on them is even worse as Iraqis are forced to contend with not one additional gang of foreigners but many. The news media doesn't report on such complicated street realities, preferring to dumb down the conflict as a battle between Shiites and Sunnis in the central portion of Iraq with the Kurds staying out of a fight that isn't theirs. Such a depiction is so simplistic it presents a false picture of what's really going on. The worst-case scenario in this complicated mess is far worse than what's acknowledged by the Bush administration, or even the president's harshest critics. Portions of Iraq melting down into warlord territory and playing host to Al Qaeda training camps is a bad enough outcome. Sectarian violence throughout all Iraq's provinces would be worse. The far worse scenario the Bush administration fears, but won't discuss publicly, is the same one the media isn't probing: a regional outbreak of tribally induced wars on a scale more akin to world war. Yet there is, as former gangbanger Marcellus "Bishop" Allen says, hope. Gang violence in some cities has been reduced by groups like Philadelphia's SOS. Because they're comprised mostly of former gang members, the audience listens. If we really want to end the violence in Iraq we need to do the same thing: recruit Iraqis with the street cred and skills to bring about peace among the tribes. It isn't naively pacifistic to observe that this is not the skill set of a typical American soldier. Nor is it an attack on democracy, or President Bush's promiscuous faith in it as a cure all, to observe that forms of government aren't, in themselves, capable of settling disputes between people who feel the other tribe is about to kill them. It doesn't work that way. It is merely stating the obvious to say that troops are simply the wrong tool for the job. "We need ya'll to know none of you can stop anything we want to do. None of ya'll." That's as true in the streets of Baghdad as it is in Philadelphia, or San Jose.